Our network of AIS coverage around the world is amongst the best in the industry. However we are always looking to add new areas and improve existing ones. Thanks to John Ambler on the Isle of Wight sharing his AIS data directly to our servers our users now have greatly improved real time coverage around the Solent and English Channel. Here’s a screenshot showing the range of ships his receiver is picking up from an aerial 200 feet above sea level on the island. 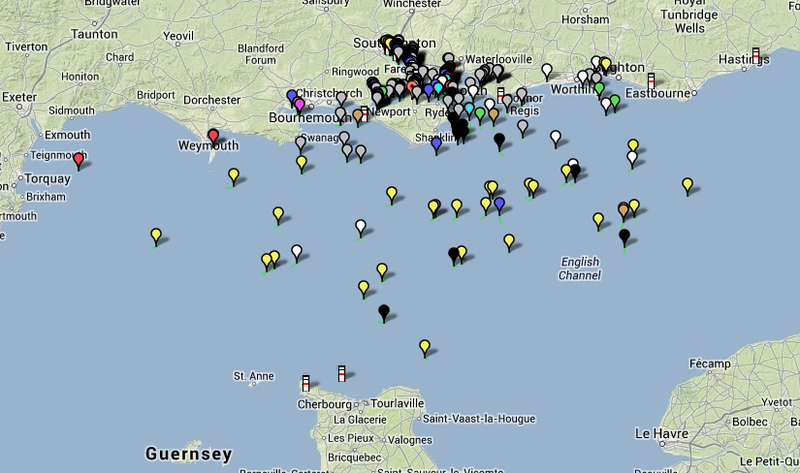 You can check the live coverage on John’s web page and in real time on Boat Beacon and SeaNav too. A big thank you to John and complimentary copies of all our marine apps. Another sea trial today. Out of Portishead Harbour up channel to the Second Servern Crossing and back on the turn of the tide. No “sinkings or drownings” though a lot of diesel fumes and some litres lost due to the fuel tank filler nozzle fracturing off in the “moderate to severe” seas in force 5/6 – spray right over the top of the boat and front of the boat completely under water at times! A bit of a baptism of fire for my young son, but he coped admirably. We had 3 serious close encounters with a large dredger off Avonmouth that Boat Beacon really helped with. First off, Boat Beacon started flashing that the dredger was on a collision course with us even though visually it looked like it was sideways on passing behind us. The currents are deceptive. We could find out the name of the ship immediately from Boat Beacon, UKD BLUEFIN, and thus radio it to ask what its intentions were. Unfortunately no reply on VHF channel 16. Then we heard another Boat call up the Bristol port authority (VTS) on channel 12 about the ship to ask what it was doing. If we hadn’t known the ship’s name we would not have appreciated the value of the subsequent radio dialogue. It was dredging just outside the port and would turn round to go back in to port to continue its dredging. So although we thought it was headed straight for us – it turned and went back and we carried on. An hour later on our return down estuary to Portishead the ‘Death Star dredger’ BLUEFIN came out of Avonmouth yet again headed straight for us on our port side. We were hoping/thinking it might just turn around again to head back in to continue dredging. We radio’d the Port Authority to ask what its intentions were. No. This time it had finished dredging for the day and was really heading for us on its way to drop its load on the spoil ground off Portishead. So we made a speed and course change to pass behind it. The long straight white dotted track line leading North is the bug we discovered in the first day of Sea trials – fixed for the next release of SeaNav. 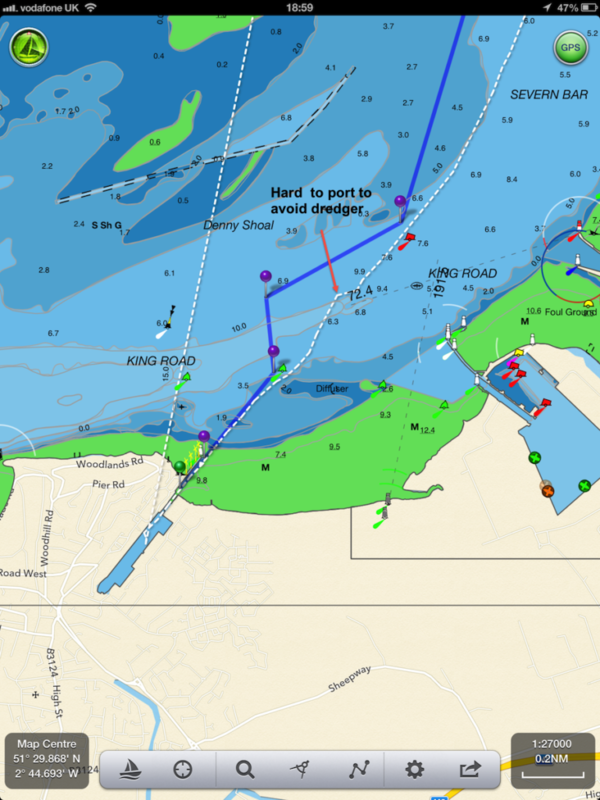 We took Sarita, my 27′ catamaran out to test the latest versions of SeaNav and Boat Beacon at sea in the Bristol Channel. The planned route was a 6 hour passage on the ebb tide from Chepstow to Cardiff (see SeaNav route plan below). 3 persons on board; Captain Keith Avery of the RSS Discovery ( see the excerpt from Sarah Casey’s book – the Wave ) , our Vicar, also an ex-merchant navy officer and myself. Illustrious company. The trip went well and to plan until we were just off Portishead where strong wind against tide made the going very uncomfortable and slow. As we didn’t have to get to Cardiff that day we decided to stop over in Portishead. Boat Beacon transmitted our position faithfully and my family tracked our progress live on our Boat Watch app and the web ( http://boatbeaconapp.com/go/MMSI ). Captain Avery helmed most of the way and was impressed with our apps. Check the screenshots below for the route, track and web views. The blue line and pins are the planned route and waypoints, the white dotted line is the recorded track. 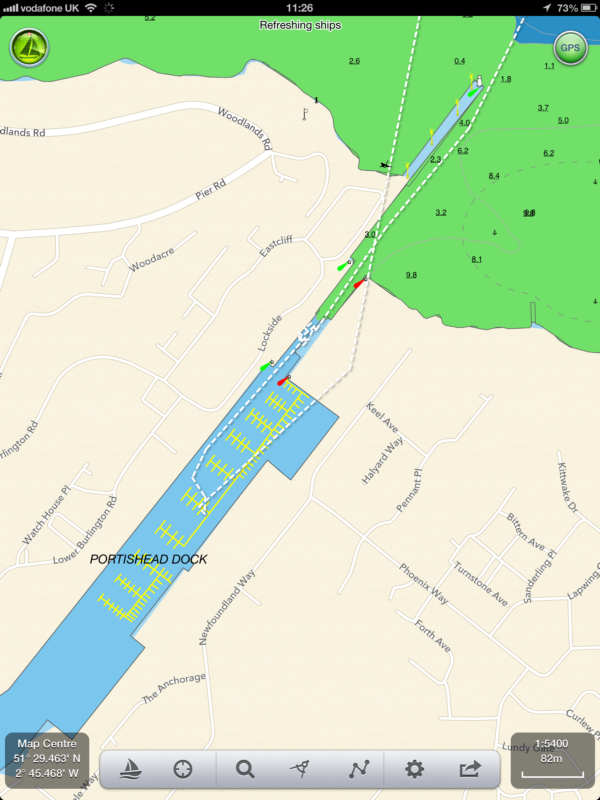 You can see the exact pontoon we tied Sarita up at in Portishead Dock! The clock read midnight when the hundred-foot wave hit the ship, rising from the North Atlantic out of the darkness. Among the ocean’s terrors a wave this size was the most feared and the least understood, more myth than reality—or so people had thought. This giant was certainly real. As the RRS Discovery plunged down into the wave’s deep trough, it heeled twenty- eight degrees to port, rolled thirty degrees back to starboard, then recovered to face the incoming seas. What chance did they have, the forty-seven scientists and crew aboard this research cruise gone horribly wrong? A series of storms had trapped them in the black void east of Rockall, a volcanic island nicknamed Waveland for the nastiness of its surrounding waters. More than a thousand wrecked ships lay on the seafloor below. Captain Keith Avery steered his vessel directly into the onslaught, just as he’d been doing for the past five days. While weather like this was common in the cranky North Atlantic, these giant waves were unlike anything he’d encountered in his thirty years of experience. And worse, they kept rearing up from different directions. Flanking all sides of the 295-foot ship, the crew kept a constant watch to make sure they weren’t about to be sucker punched by a wave that was sneaking up from behind, or from the sides. No one wanted to be out here right now, but Avery knew their only hope was to remain where they were, with their bow pointed into the waves. Turning around was too risky; if one of these waves caught Discovery broadside, there would be long odds on survival. It takes thirty tons per square meter of force to dent a ship. A breaking hundred-foot wave packs one hundred tons of force per square meter and can tear a ship in half. Above all, Avery had to position Discovery so that it rode over these crests and wasn’t crushed beneath them. He stood barefoot at the helm, the only way he could maintain traction after a refrigerator toppled over, splashing out a slick of milk, juice, and broken glass (no time to clean it up—the waves just kept coming). Up on the bridge everything was amplified, all the night noises and motions, the slamming and the crashing, the elevator-shaft plunges into the troughs, the frantic wind, the swaying and groaning of the ship; and now, as the waves suddenly grew even bigger and meaner and steeper, Avery heard a loud bang coming from Discovery’s foredeck. He squinted in the dark to see that the fifty-man lifeboat had partially ripped from its two-inch-thick steel cleats and was pounding against the hull.Below deck, computers and furniture had been smashed into pieces. The scientists huddled in their cabins nursing bruises, black eyes, and broken ribs. Attempts at rest were pointless. They heard the noises too; they rode the free falls and the sickening barrel rolls; and they worried about the fact that a six-foot-long window next to their lab had already shattered from the twisting. Discovery was almost forty years old, and recently she’d undergone major surgery. The ship had been cut in half, lengthened by thirty-three feet, and then welded back together. Would the joints hold? No one really knew. No one had ever been in conditions like these.One of the two chief scientists, Penny Holliday, watched as a chair skidded out from under her desk, swung into the air, and crashed onto her bunk. Holliday, fine boned, porcelain-doll pretty, and as tough as any man on board the ship, had sent an e- mail to her boyfriend, Craig Harris, earlier in the day. “This isn’t funny anymore,” she wrote. “The ocean just looks completely out of control.” So much white spray was whipping off the waves that she had the strange impression of being in a blizzard. This was Waveland all right, an otherworldly place of constant motion that took you nowhere but up and down; where there was no sleep, no comfort, no connection to land, and where human eyes and stomachs struggled to adapt, and failed.Ten days ago Discovery had left port in Southampton, England, on what Holliday had hoped would be a typical three-week trip to Iceland and back (punctuated by a little seasickness perhaps, but nothing major). Along the way they’d stop and sample the water for salinity, temperature, oxygen, and other nutrients. From these tests the scientists would draw a picture of what was happening out there, how the ocean’s basic characteristics were shifting, and why. These are not small questions on a planet that is 71 percent covered in salt water. As the Earth’s climate changes—as the inner atmosphere becomes warmer, as the winds increase, as the oceans heat up—what does all this mean for us? Trouble, most likely, and Holliday and her colleagues were in the business of finding out how much and what kind. It was deeply frustrating for them to be lashed to their bunks rather than out on the deck lowering their instruments. No one was thinking about Iceland anymore.The trip was far from a loss, however. During the endless trains of massive waves, Discovery itself was collecting data that would lead to a chilling revelation. The ship was ringed with instruments; everything that happened out there was being precisely measured, the sea’s fury captured in tight graphs and unassailable numbers. Months later, long after Avery had returned everyone safely to the Southampton docks, when Holliday began to analyze these figures, she would discover that the waves they had experienced were the largest ever scientifically recorded in the open ocean. The significant wave height, an average of the largest 33 percent of the waves, was sixty-one feet, with frequent spikes far beyond that. At the same time, none of the state-of-the-art weather forecasts and wave models—the information upon which all ships, oil rigs, fisheries, and passenger boats rely—had predicted these behemoths. In other words, under this particular set of weather conditions, waves this size should not have existed. And yet they did.